The Stevens Creek Striders are very proud to present the annual Stevens Creek Striders Trail Races. This race is our major fundraiser for the year and your participation will ensure that our club can continue to do good things for the local running community (including putting on races like this). 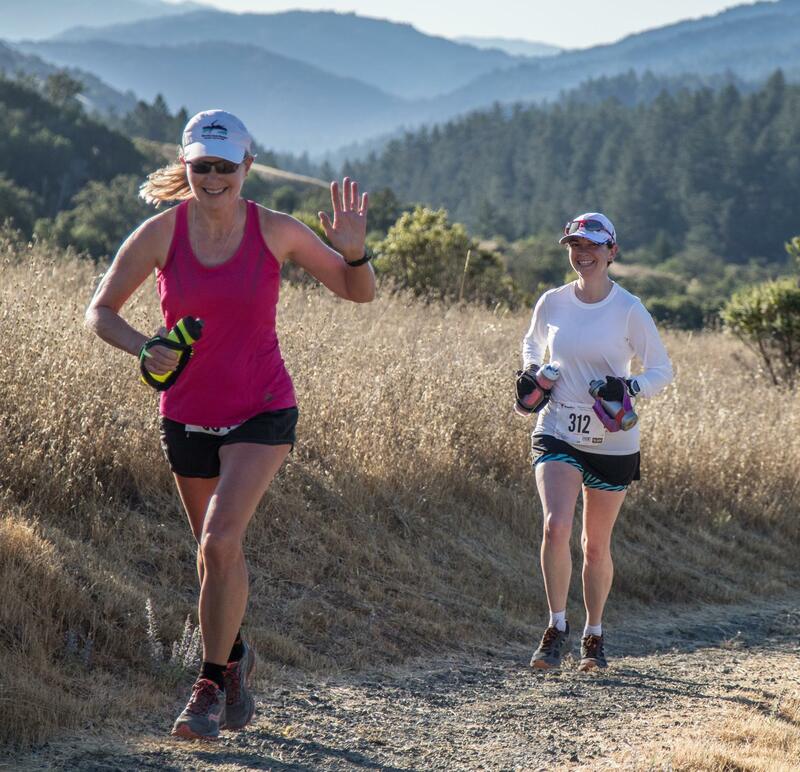 These races give you the chance to run through some of the most beautiful open spaces we are lucky to have so close to us, including Monte Bello, Saratoga Gap, Long Ridge, Skyline Ridge, and Russian Ridge Open Space Preserves. Small is beautiful: our permit with the Open Space District limits our total runners to 150, so space is limited in each race. 30K and 50K: $70. $85 after August 6, 2018. Half Marathon: $60. $70 after August 6, 2018. Stevens Creek Striders Running Club members enjoy a $15 discount on race pricing for all events. Not a member? Join today for only $30/year. REQUIRED, and likely to sell out. I.e., race day registration is highly unlikely to be available. Skyline Ridge Open Space Preserve parking lot on the west side of Highway 35, generally known as Skyline Boulevard. The parking lot is about 0.9 miles south-south east of the intersection of Page Mill Road and Highway 35, and it is about 5.4 miles north-north west of the intersection of Route 9 and Highway 35. From the north-east, it is probably best to use Highway 92 or Highway 84 to reach Highway 35 (Skyline Boulevard), and then go south until you pass Page Mill Road. The entrance to the parking lot is about 0.9 miles further on the right. From the middle of the Peninsula (e.g., Palo Alto), use Page Mill Road or Moody Road/Page Mill Road to reach Highway 35 (Skyline Boulevard). Turn left on Highway 35. The entrance to the parking lot is about 0.9 miles further on the right. From the south, use Route 9 from Saratoga to reach Highway 35 (Skyline Boulevard). Turn right on Highway 35. The entrance to the parking lot is about 5.4 miles north on your left. 8:00 am. Please check in by 7.30 am. For slower 50K runners expecting to take longer than 8 hours, we will provide an early start at 7:00 am. Please check in by 6.45 am. Due to the advantage of running in cooler conditions, the early starters cannot qualify for the place awards, but will receive all finisher swag and an official finish time. For slower 30K runners expecting to take longer than 8 hours, we will provide an early start at 7:00 am. Please check in by 6.45 am. Due to the advantage of running in cooler conditions, the early starters cannot qualify for the place awards, but will receive all finisher swag and an official finish time. 10:00 am. Please check in by 9:30 am. Pick up bibs on race day before your race. Registration desk will open at 07:00 for alll runners. Race briefing will take place 15 minutes before each race. Arrive early enough to get your bib and be ready to race! Hand timing. All races will record your time based on the gun time of the event. 5 mi. (WO), 11 mi. (FA), 17 mi. (WO), 19 mi. (FA), 23 mi. (WO), 25 mi. (FA) and 29.8 mi. (WO). 3 mi. (WO), 5.2 mi. (FA), 8.7 mi. (WO), 11.1 mi. (WO). “Full Aid” is comprised of: Water, Tailwind electrolyte fluid, Coke, GU, potato chips, cookies, PB&J sandwiches, etc. See maps below for aid station locations. Yes, including sandwiches, beer and other goodies. Most welcome and very much needed! Please register your possible interest on the UltraSignup.com link shown above. This year we will be sending all finishers home with both a fine race T-shirt, GU product and a Striders pint glass. There will be a post-race raffle at the awards ceremony. Please enter your t-shirt size at time of registering at ultrasignup.com. A mix of single-track and fire road, covered woods and open hillsides. Two crossings of Stevens Creek; quite likely in September neither will involve getting wet. Course drains well and only minor mud will be encountered, probably none unless it has rained hard and recently. The basic route proceeds south (southeast) from the start via Stevens Canyon and up the Table Mountain/Charcoal Flat Trail to Saratoga Gap, then back via Long Ridge Open Space Preserve to the start, then north (northwest) along the Bay Area Ridge Trail through Russian Ridge O.S.P. to Rapley Ranch Road and then back. Climbing is approximately 4640′ overall (see profile below) but with only one sustained climb (1100′ over 3.6M) and virtually all climbs are “runnable” (i.e., only a few short “very steep” sections). At the same time, however, virtually the entire course is rolling; there are no flat sections of any significant length. This 30k course is essentially the first 60% of the 50k race. The basic route proceeds south (southeast) from the start via Stevens Canyon and up the Table Mountain/Charcoal Flat Trail to Saratoga Gap, then back via Long Ridge Open Space Preserve to the Finish. Climbing is approximately 2800′ overall. The 13.1 mile (Half Marathon) course comprises the last 40% of the 50k course plus a short, but steep, out-and-back section towards pretty Mindego Hill. From the start the course runs north (northwest) along the Bay Area Ridge Trail through Russian Ridge O.S.P. to Rapley Ranch Road and then back. Climbing is approximately 2251′ overall. This is a great introduction to trail racing – it will challenge you in this distance. Plenty available at Start/Finish (free). When you enter the parking lot, turn LEFT and park in the “Equestrian lot” (i.e., do NOT turn right and park in the main lot which is where one usually parks at this preserve). At the start/finish area there are port-a-potties in the parking lot. On the course you pass through (within 30 yards) that same area after the 19M aid/finish line; the only other bathroom is in the Russian Ridge parking lot (mile 22 and 29). There are also 31 miles of trails. Please use common trail etiquette to dig a pit off the trail if you need to relieve yourself. Get the RunGo app for your iPhone or Android device. The RunGo app provides you with voice navigation prompts for turn-by-turn directions. Make sure to load the map while you have data coverage (before coming to race) and then click on “Start Run” ahead of starting the race. Works in airplane mode as well. If you are afraid of getting lost on this route, get this app and use it.